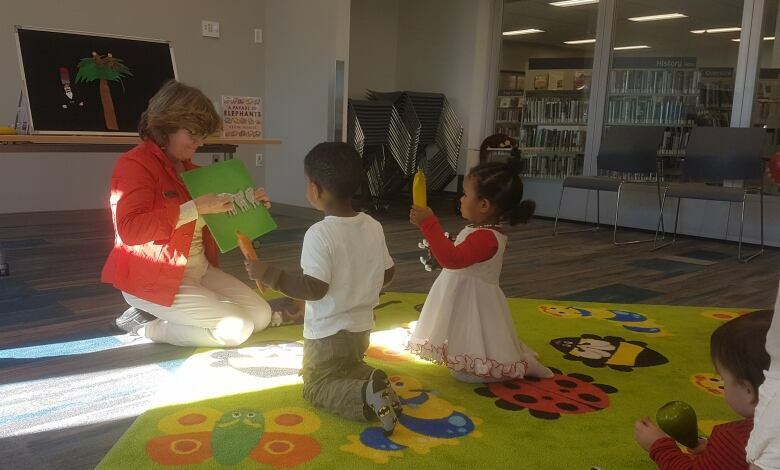 Jane Grigg says she is still learning new ways to foster a love of reading in children after 38 years of running storytime programming for toddlers at a Regina library. "I just find that so rewarding, to watch children learn and play," said Grigg. "They are not like adults thinking ahead, worrying, and concerning themselves with things. They are just engaged and in the moment. I think now as adults we want to be more like that." Grigg has been running 'Mainly Mother Goose' and 'Toddler Time' for nearly 40 years at the Regina Public Library's George Bothwell branch. She said it was one of the first such programs in Canada. 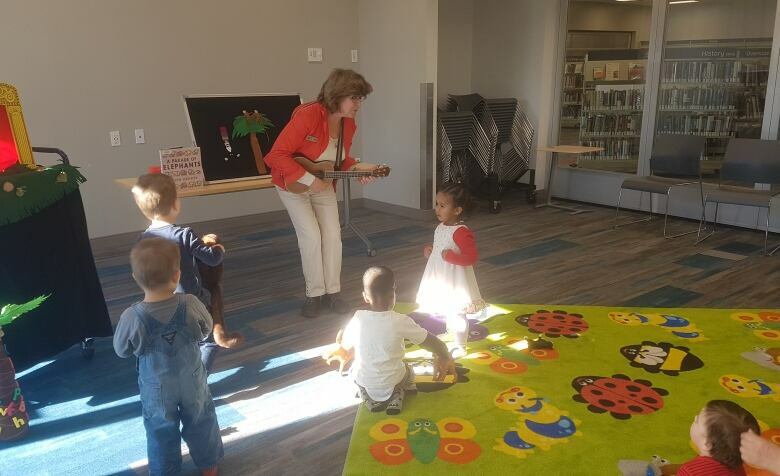 Every Wednesday, Jane Grigg starts the toddler program by playing her ukulele, as the kids clap and sing along to nursery rhymes or songs made up by Grigg. 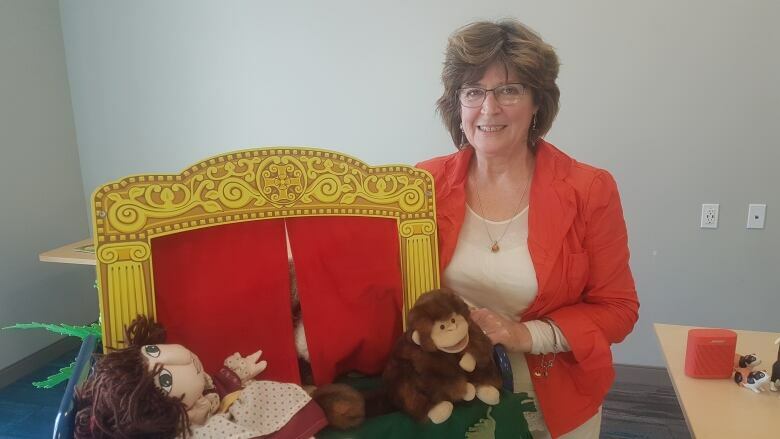 She dances along with the children to music, becomes a puppet master of jungle animals and brings stories to life by using a different voice for each character. Each activity reinforces a storyline or theme from a children's book. "I really like to take the approach of a topsy-turvy​, inside-out world, which is really mother goose itself," said Grigg, Reference and Programing Assistant for George Bothwell library. She started the free programs long before people understood the power of introducing literacy at a young age. "There was no real material to work with, there wasn't really books or resources," said Grigg. "We know now the amount of learning that takes place before the age of three is astonishing." She developed the programs after using a book called Your Baby Needs Music by Barbara Cass-Beggs with her first child. "I realized a lot of people would enjoy rhyming and bouncing with their children but maybe didn't have access to the songs or didn't feel comfortable singing," said Grigg. One day while working at the library, she was called to the phone to answer a question about the program. The man said, "How did you teach my son all of his body parts?" Grigg replied, "We sing, and rhyme, and we use the resources of the history of our language which translates to learning. "That was the example of what happens, the learning that takes place." The children don't only learn colours and shapes. Grigg said they also learn social skills like sharing and taking turns. Katherine Van der Gucht, a mother of three, has been a regular at the program for two years. "Jane really makes it special. She is so good with the kids, keeps the whole group entertained but focused, but let's them be kids and run around and have fun," said Van der Gucht. "It's always different every time. She always has a theme and different stories so its new and exciting each week."